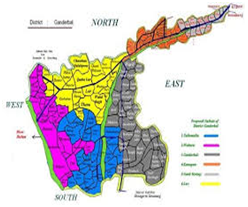 District Ganderbal is situated on the North of District Srinagar from which it was carved out and given the status of District on Ist April 2007.The District Ganderbal comprises of four medical Blocks namely Ganderbal, Kangan, Lar and Wakura. There are two Sub District Hospitals one at Ganderbal and another at Kangan which provide better health care facilities to the general public round the clock. More over one Trauma Hospital has been established at Kangan. One 200 bedded District Hospital is under construction at Duderhama Ganderbal with an estimated cost of Rs 5255.79 Lacs. Due to incompletion of District Hospital Ganderbal and rush of the patients the routine work gets hampered and the patient care is affected. District Hospital Ganderbal is short of manpower and the sanctioned staff is not as per the requirements and as per the sanctioned strength for other District Hospitals viz Baramulla, Anathnagh, Kupwara etc. Some of the main specialists like ENT, Orthopedics, Dermatology, and Ophthalmology have not been sanctioned for the district hospital as yet. Ganderbal district, with its district headquarters located at 33.73°N 75.15°E, at an average elevation of 1,950 meters (6,400 ft) above sea level, at a distance of 21 kilometers from Srinagar city. Ganderbal district is spread across the Sind River. The river is considered as the lifeline of the district. It is the only river in Jammu and Kashmir state on which three hydroelectric power stations are functional; besides that the river provides water for irrigation, 80% population of the district is engaged with farming. The sand (bajri) of this river has a great value for money for its quality. Ganderbal district possesses all the typical characteristics of the climate of Kashmir Valley as a whole. In the heat of July, the breeze of the Singh River is a welcome relief. As per census 2011, the District has population of 297446. Now as per SRO 319 dated:-3-7-2013 issued by Govt, the population of nine more villages has been incorporated in the district Ganderbal carved out from District Srinagar numbering to 19323 souls. The total population of district Ganderbal is now 316769 souls. In Addition to above mentioned health institutions one 200 bedded District Hospital at Duderhama Ganderbal, one 100 bedded MCH at Kangan and one GNM at Duderhama Ganderbal is under construction.